Introduction: EBV-associated Gastric Cancer (EBVaGC) comprises about 9% of all cases of GC and constitutes a distinct clinicopathological and molecular entity. The pattern of viral expression in EBVaGC cannot be set to any of the previously EBV-associated malignancies. Several lines of evidence support that viral expression in EBVaGC is characterized by high transcription of the BamH1- A rightward transcript (BART), low-levels of EBNA-1 and lack of LMP1. The high transcription activity of the BamH1-A region is importantly directed to express BART miRNAs, supporting a critical role for these miRNAs during epithelial cell infection and carcinogenesis. Several studies have shown that promoter hypermethylation is also a prominent feature of EBVaGC. Based on the recent TCGA report, the specific fingerprint of genomic alterations in EBVaGC is marked by mutations in PIK3CA, ARID1A and BCOR genes, and amplification of 9p24.1 that harbors the genes for the JAK2, PD-L1 and PD-L2 proteins. The specific programs of viral gene expression, promoter methylation and genomic mutations found in EBVaGC target cell signaling pathways leading to increased proliferation, increased cell survival, immune evasion, augmented EMT and acquisition of stemness features. 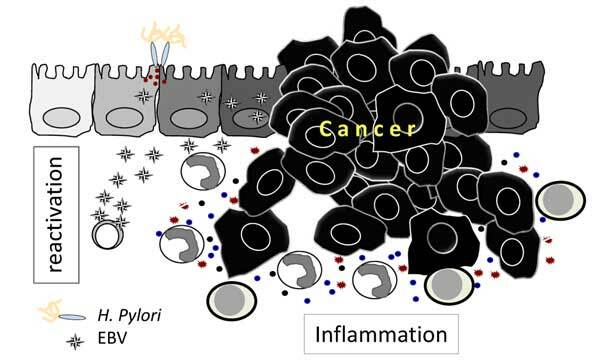 Less understood is the participation of EBV in chronic gastric inflammation, but some studies argue that EBV, similar to and together with Helicobacter pylori, is an early participant in the GC oncogenic process through promoting chronic inflammation and increased tissue damage. Conclusion: Here, we discuss the principal and distinctive carcinogenic routes promoted by EBV in the gastric epithelium. Gastric cancer, Epstein-Barr virus, BART miRNAs, EBERs, EBNA1, LMP2A, methylator phenotype, chronic inflammation.